Posted by showmescifi in comic books, comics, Dark Horse, darkhorse, jedi, scifi, sith, Star Wars, starwars. It wasn’t all that long ago that I reviewed Darth Bane : Path of Destruction . 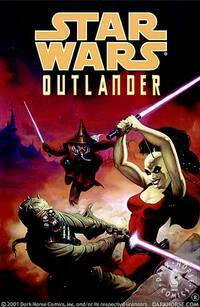 Little did I know at the time that the book was little more than a novelization of this comic. 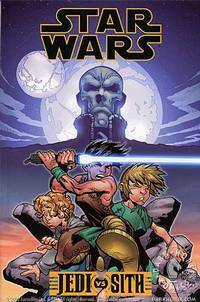 Star Wars Jedi vs. Sith is the graphic novel (or trade paperback) that collects the six issue Dark Horse comic book series. The art is manga’ish and blocky but it is engaging. The story well – it’s fantastic. 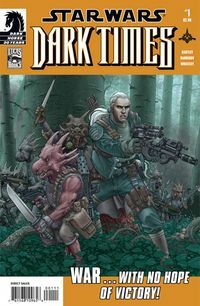 Jedi vs. Sith tells the same story that fills the back half of Darth Bane : Path of Destruction – A thousand years ago the Sith were many and they battled endlessly with the Jedi Army of Light. Lord Kaan ruled the Sith Brotherhood of Darkness and sought the destruction of Lord Hoth and his Jedi followers. Darth Bane emerges as THE SITH and the Jedi walk away thinking they’ve ended the Sith forever. In comparison to the book – which i read first even though the comic book predates it by some 5 years – the comic book is quick and fast paced. The book is a different type of engagement, looking deeper into Darth Bane the man, the sith and the motivations behind things. The comic is…well it’s a comic. You just can’t get the same sort of introspection and development (not typically at least). I am glad i’ve read both though as the experience of reading a comic is very very different than reading a novel. It’s not quite like taking two viewpoints of the same history, more like looking at two versions of the same painting. The biggest addition in the comic book are the kids – only one whom (Rain) even makes an appearance in the novel. celebrations for Star Wars. It’s expect to be available April 4th of 2007. Personally I don’t have a problem with the softcover (and it’s cheaper). You can click on the first cover image to see if Dark Horse still has any (of the cheaper version) avail. Posted by showmescifi in comic books, comics, Dark Horse, darkhorse, KOTOR, scifi, sith, Star Wars, Star Wars Comic Books, starwars. The Golden Age of comics was dominated by DC Comics, home to Superman, Batman and Wonder Woman. The Silver Age belonged to Marvel with Spiderman, the Hulk, Fantastic 4 and Captain America. Does the third age of comics belong to Dark Horse? 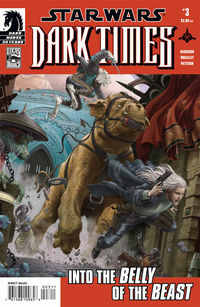 Regular readers of ShowMeSciFi know all about Dark Horse Comics. They are after all the publisher of all Star Wars Comics including of course the ‘new stuff’ like Legacy, KOTOR and Dark Times. 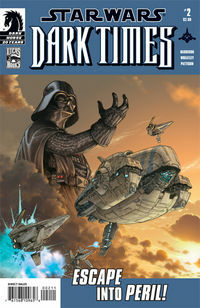 Recently TwitchGuru.com took a look inside the world of Star Wars Comics. This week they take a look inside Dark Horse Comics itself. Posted by showmescifi in comics, Dark Horse, darkhorse, jedi, scifi, sith, Star Wars, Star Wars Comic Books, star wars dark times, starwars, starwars darktimes. I just picked up both issues #1 and 2 of Star Wars : Dark Times. Apparently issue #2 was DELAYED. Issue #1 came out in early november while Issue #2 came out late last week (Jan 24). Starting a new series with such a gap is hardly a way to start a series. But for me it’s not too bad since i got both issues a the same time and didn’t have to wait two months for an issue. Now on to the good stuff and make no mistake about it, Dark Times is good stuff. Plot is a bit predictable given the time period – which sometime close after the end of Episode III with jedi on the run and vader trying to figure out wtf is going on and what he’s supposed to be doing. The artwork is spectacular with a photorealistic airbrush kind of approach that give this title a very sleek and somewhat unique look in the modern Star Wars pantheon of KOTOR and Legacy. I am looking forward to issue #3 but i’m putting Dark Horse on notice – if it’s two months late I’m not likely to buy it. Posted by showmescifi in comic books, comics, Dark Horse, darkhorse, jedi, knights of the old republic, KOTOR, scifi, Star Wars Comic Books, Star Wars Expanded Universe Books, starwars. 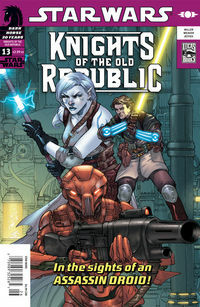 This issue is the second (and final) in a mini-story arc that began in Knights of the Old Republic #11. Basically Zayne’s dad gets kidnapped by pair of Hammerheads in the last issue and in this issue Zayne rescues him. It’s really that simple (and relatively lame). c: The Jedi know both a and b. 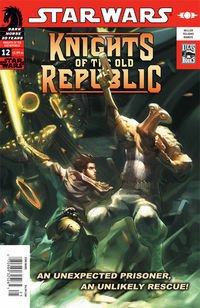 Beyond that this issue doesn’t offer much, but for regular readers of KOTOR (like myself) it’s all part of the master plan i guess – and like every other issue – a Must Read. I’m looking forward to issue #13 already though just to see what the next story arc will bring. We haven’t seen the Sith yet, maybe they’ll finally make their intro. Posted by showmescifi in comics, darkhorse, jedi, scifi, sith, skywalker, Star Wars, Star Wars Comic Books, star wars legacy, starwars, starwars legacy. 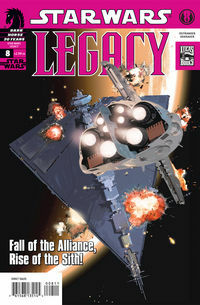 I’ve been a loyal reader of Legacy since issue O. By far and away this is the best issue of Legacy yet – and that is saying alot. Action, plot, fantastic art – this issue has got it all. 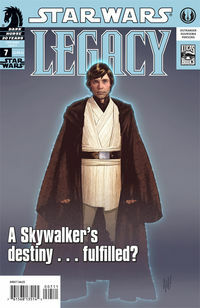 As the end of the first major story arc in Star Wars Legacy it is a fitting conclusion and a natural end. 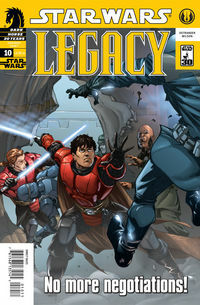 Cade makes his choice and as the cover of the issue implies he follows his destiny. I’m a little surprised he left his pirate buddies behind on Bastion but no doubt Ostrander will find a way in his brilliant script to reconnect them and i suspect that the next time they’ll be an opposing end of a blaster and/or lightsaber. Posted by showmescifi in comic books, comics, darkhorse, jedi, knights of the old republic, scifi, Star Wars, Star Wars Comic Books, starwars. A new two-part story begins as fugitive Padawan Zayne Carrick and the crew of the Last Resort devise a plan to nab some much needed cash. On the banking world of Telerath they set their plot into motion unaware the bounty on their heads is about to catch up to them. Yet there’s more going on than the schemers or their hunters realize, and when it all blows sky-high an unexpected reunion will throw Zayne’s life on the run into question. Alright the first story arcs were pretty cool and now we’re setup for 2 issue story arc which is coool since it’s not too stretch out. Wanna take a guess at what the ‘unexpected’ reunion is? Come on..take a guess…. Alright i’ll just come out and tell ya. It’s Zayne’s dad, but we don’t get to that until the last page. A bit of a waste but hey it kind of does leave you wanting for more…I for one can hardly wait to read issue #12! Posted by showmescifi in comics, darkhorse, jedi, sith, Star Wars, Star Wars Comic Books, Star Wars Expanded Universe Books, starwars. 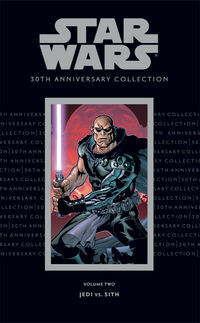 This the concluding book to the epic begun in The Golden Age of the Sith. The Fall of the Sith Empire is rapid rate story. Jori makes it back, the Sith follow with an all out attack that ultimately ends in the fall of the Sith Empire. Little (or no) intrigue, plot or character development. It’s just good basic Sith on Jedi fun. The Sith decide to take on the Republic and fail. I can’t imagine any Star Wars fan not wanting to own this book, though not brilliant it does describe a critical era in the Expanded Star Wars Universe history.